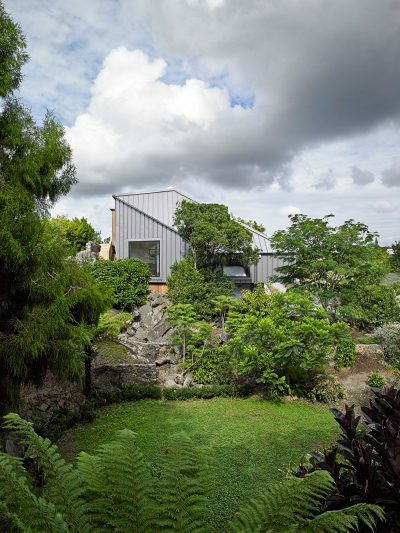 The house is perched on a rocky outcrop overlooking the cricket fields of Melville Park in Epsom. Our adventurous clients, in their 70s and 80s, had an impulse to build one last house which they refer to as their ‘departure lounge’. 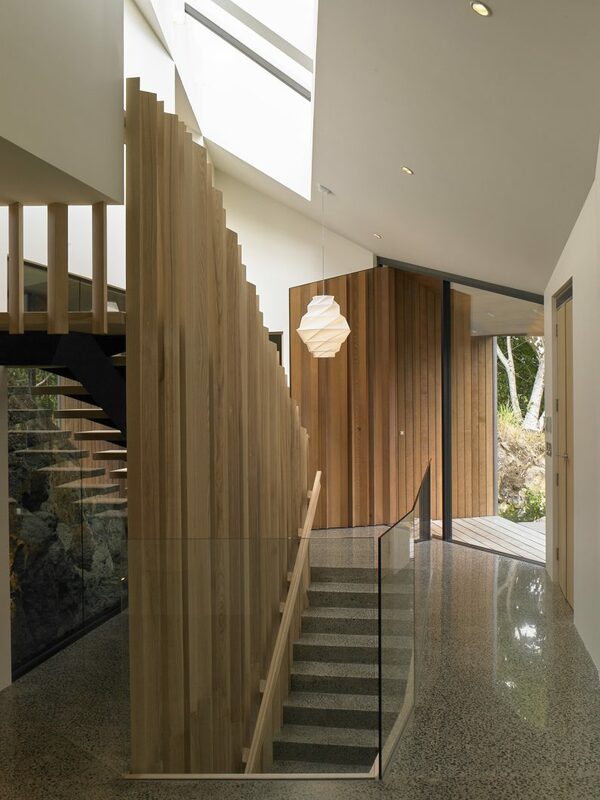 They sought a home which was exciting yet comfortable and big enough to accommodate family and friends. It was a courageous endeavor on their behalf considering the difficult and inhospitable nature of the site, but they were up for the challenge. As architects we were excited by this and explained that difficult sites made for interesting architecture. The site resembled a quarry more than a suburban plot with a monolithic volcanic outcrop at its core. This large rock forms the centre-piece of the house design, a geological artifact enclosed within a vitrine, with living spaces wrapping around and over the top. 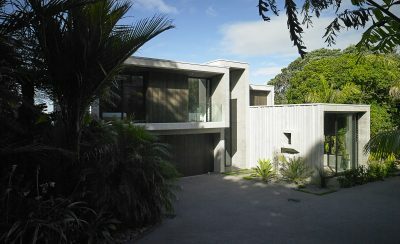 The top level contains the living areas and main bedroom and opens out to sunny decks with views across the park to Mt Eden. This affords our clients the ease of single level living for the majority of the time. The three levels are connected by a lift, allowing disabled access from the garage to the top floor living areas and to the mid-floor home cinema, study, laundry and guest areas. Formally, the tent-like metal roof and walls are folded over and around the central volcanic rock creating angular sculpted spaces between. Natural light falls through ceiling apertures accentuating the contrast between the lightness of the skin and the weight of the earth.